Are you an artist who struggles with color? Do you find yourself unable to achieve color harmony in your artwork? Well you are not alone. Did you know that over 70% of artists admit that color is one of their biggest obstacles? There is a good chance you are amongst those 70% or you would not be reading this post right now. If you take the time to work on the exercise below, you will have a new appreciation and understanding of color, and it won’t take years of practice either. You can become more knowledgeable about color after only one session. I am talking about an exercise that will greatly increase your understanding of the properties and interactivity of the colors on your palette. I am talking about creating color charts and lots of them. You see, the problem with many artists, myself included at one time, is that we tend to just jump right into our work haphazardly without learning proper foundational skills. This will only create frustration and waste lots of your time and materials. So how will creating color charts benefit you as an artist? Well apart from understanding how colors interact when mixed with one another, you will also have a resource or tool that you can reference over and over again. Lets say you have a particular color scheme in mind…say a complimentary scheme of red and green. Just pull out your red and green color charts and you will instantly know what colors you could use and how to mix them. No more guesswork or wasted paint! You will also be introduced to color mixtures that you never thought were possible. Far too often, we fall into the habit of using the same colors over and over again when something else may work better. Why limit yourself when you have an almost limitless palette of colors at your disposal? 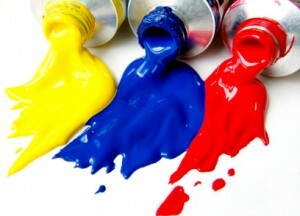 Paint – It doesn’t matter what colors you choose to begin with. When I did my first color chart, I wanted to start by mixing greens. I love landscape painting, so I wanted to see how many different versions of green I could create from various combinations of yellow, blue, black, red and orange. Support – I like to use canvas boards for my color charts. They are inexpensive and strong and will last a long time if you take good care of them. Brush or Palette Knife – I prefer to use a palette knife to make the swatches if I am using oil or acrylic paint. This way you can just wipe the knife clean when creating a new swatch. Obviously if you are using watercolor, you will need to use a brush. That’s all you are going to need to get started. To begin with, we need to create a grid on our canvas board. You can use a ruler or other straight edge to create the grid. Make the grid so that it is divided into one inch squares with five rows. Leave some room at the bottom of each column so that you can label it with the specific colors that you used or take other notes. Next, lets pick a color as our starting point. As I said earlier, it doesn’t matter what colors you start with, but for arguments sake, lets begin with Cadmium Yellow Light. Hopefully you have this color in your palette, if not, just use whatever light yellow you have. With your palette knife, fill in the top left square of your grid with your light yellow, straight from the tube. Next fill in the very bottom square of the same column with a mixture of titanium white and a touch of light yellow. Now create a mixture of light yellow and titanium white with a value that is half way between the top and bottom values and put that in the middle square. Now create a mixture of light yellow and white with a value that is half way between the first and third squares and put that mixture in the second square. Repeat the same process for the remaining squares and you have your first column of color swatches completed. You now have five different values of light yellow. Now you can move on to the next column. This time try mixing light yellow with another color from your palette, like orange for instance, with the light yellow slightly predominating. Then you adjust the values of each swatch with white like you did for the first column. Then just continue the process using all of the colors on your palette. You will now have a ton of new colors that you never knew existed before to breathe life into your next painting.